The BMC Filters panel air filter is commonly referred to as a replacement air filter. It is installed in the vehicle's original airbox to replace the OEM air filter. It is made of highly performing materials that allow an increased air flow combined with a more efficient filtration, guaranteeing containment of all impurities from as small as 7 microns (compared to OEM's 10 microns). BMC Filters are produced using a Full Molding system that enables the characteristic red filter to be realized from a single mold with no welded joints thus avoiding easy breakage. 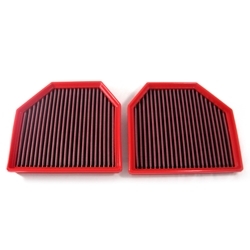 The rubber used in BMC air filtering systems has a long life, is very durable and has optimum adhesion characteristics to all shapes of airboxes. BMC Filters are made of a multi-layered cotton gauze soaked with low viscosity oil covered with an epoxy coated alloy mesh to ensure protection from petrol fumes and oxidization due to air humidity. All BMC Filters air filters are pre-oiled, and they can be washed and regenerated by using the appropriate BMC regeneration kit.